The exponential development of technology has allowed us to see some places we’ve never visited before. For example, Google allows us to visit some of the most wonderful destinations in the world, without physically visiting those places. Similar to Google, NASA allows us to visit some of the most abstract destinations. The latest video from the space agency allows us to travel through the Orion Nebula, which is around 1,350 light-years away. The Orion Nebula is located as the middle star of the Hunter’s sword in the Orion constellation and is a star nursery. There are a lot of new-born stars, and when observed from Earth, they look like a blur in the sky compared to the fully-formed stars. In NASA’s new video we can look at these new-born stars, thanks to the Hubble and Spitzer telescopes and infrared light. The video combines visible imagery with infrared capabilities of the Hubble and Spitzer space telescopes. The visualization specialists and astronomers from NASA made a 3D, fly-through video which travels through the Orion Nebula, which is a stellar nursery. Scientists used scientific data from the space telescopes and visual effects from Hollywood to create the breathtaking video of the Orion Nebula. The researchers behind the visualizations are at the Space Telescope Science Institute in Baltimore, and the Caltech/Infrared Processing and Analysis Center in Pasadena, California. Frank Summers, visualization scientist at the Space Telescope Science Institute, led the project. “Looking at the universe in infrared light gives striking context for the more familiar visible-light views. This movie provides a uniquely immersive chance to see how new features appear as we shift to wavelengths of light normally invisible to our eyes,” Robert Hurt, lead visualization scientist at IPAC, said in a statement. 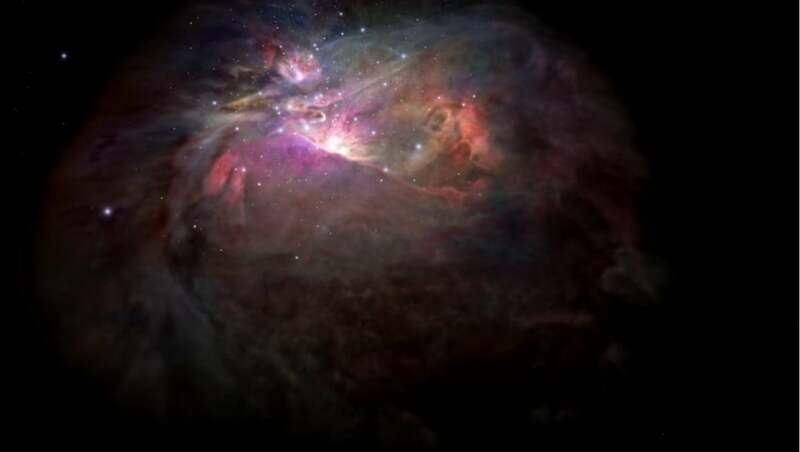 By demonstrating the capabilities of multi-wavelength astronomy, NASA’s video of traveling through the Orion Nebula supports the audience in comprehending how science works – why and how scientists use different regions of the electromagnetic spectrum to explore and learn about our universe, according to the statement. The video also prepares astronomers for what they will see with NASA’s James Webb Space Telescope, which will show even more details of the deeper, infrared features once it’s launched.